Combine the balsamic, agave, rosemary, and garlic cloves, in a large, bowl. Take half of the marinade and set aside. Take the other half in the bowl and add chicken. Allow to sit in refrigerator for 2 hours. After 1 hour, turn chicken onto other side. While you are waiting to start the other items, slice tomatoes and dice cilantro then refrigerate. You will use these to top the meal when it is done. With twenty minutes remaining on chicken marinading, take out the brown rice, bell peppers, water and 2 teaspoons olive oil. Cook rice according to package instructions approximately 45 minutes to 1 hour. Preheat the oven to 450 degrees F. Place the chicken and marinade (1/2 that it was sitting in) in a oven safe dish. Next wash the spaghetti squash, cut in halves. Remove seeds with a spoon from squash center. On a baking sheet add 3/4 cups water and face squash skin side up, opening side down. Bake chicken and squash 30 to 35 minutes. In a small saucepan while chicken, squash and rice are cooking take reserved marinade that you halved and bring to a boil. Reduce the heat to simmer and cook over low heat until thick, about 15 minutes. Set aside. Half way through cooking chicken flip sides and spoon marinade that it is cooking in on chicken. When chicken is done pull out and let rest for several minutes. Pull out squash and with a fork from top to bottom in long strokes remove spaghetti squash from skin. 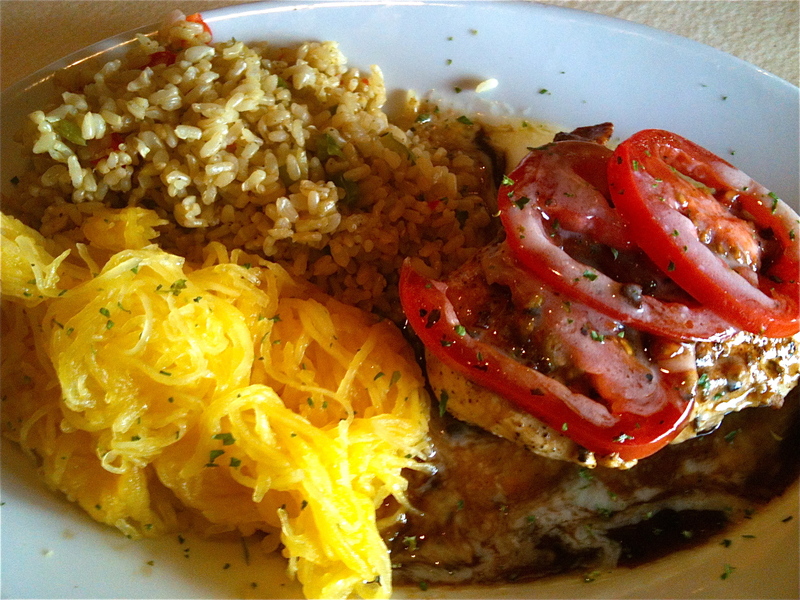 Take a piece of chicken on plate, top chicken with a spoonful of balsamic sauce, add cooked spaghetti squash and rice to the plate. Take tomato slices and top each piece of chicken. Next take diced cilantro and sprinkle over plate and serve. This is a very healthy, low fat, low carb, and low calorie meal packed with nutrients. This meal ran $2.80 per per plate. If you are preparing it for more or less you can get the cost down even lower buying just what you need. The cost was considerably less then a hamburger at your local fast food chain and so much healthier for you then processed, dead, nutrition void food. This gourmet meal was a delicious treat for all and provided us with great nutrition and energy to fuel us through the day. The trick with this meal is the timing you want everything ready at the same time so that you can enjoy your meal right when it comes out. Get your chicken marinading 2 hours before you want to cook it. If you want you can marinade it overnight and have it ready for you when you want to cook it. If you have a local farmers’ market you should be able to pick up the fresh herbs (rosemary, garlic, and cilantro) and produce (tomato and pepper) for much less then buying the large container the grocery stores sell. This will help you keep the costs down buying just what you need. You will also get fresher more affordable items.